November | 2012 | Building Solutions. Watching a football team execute offensively is exciting. Watching a church execute its ministry plan is equally exciting. The football team that wins games does it by consistently moving the ball 10 yards at a time, down the field. The church that wins in the process of designing and building a new facility does it the same way. “Winning isn’t everything, it’s the only thing” – Vince Lombardi. When it comes to winning the lost for Christ, Lombardi has it right. The church can ill afford to lose, or be penalized too often, when executing on its plan to expand facilities to reach out and make a difference in the community. How many times do we see great football teams and great churches beat themselves by failing to execute effectively or by being penalized for breaking the rules? Sometimes this process feels just as rough as a football game. Let’s have some fun by comparing some of football’s common mistakes with the common mistakes that many churches make while trying to design and build new facilities. 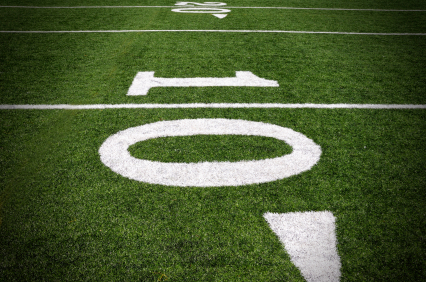 By Rule, the definition of a False Start is “After the ball is marked ready to play and before the snap begins, it is a false start if any offensive player begins action prior to the snap of the ball.” A False Start can be committed a couple different ways: Jumping into a building process before the church is actually ready or jumping into the process for the wrong reasons. Take the time to evaluate your congregation’s readiness, or health, to begin the process of designing and building new facilities. The cost of building is financial, emotional and personal. Time spent in the “huddle” making sure that everyone knows the next play and the snap count will keep your church from jumping off-sides. By Rule, the definition of Illegal Motion is “Only one offensive player may be in motion at the snap and then only if such motion is not toward his line of scrimmage.” Illegal Motion is the most common penalty enforced on the church. Many times, you see multiple members (players) in motion and all in the wrong direction at the snap. Strong and focused leadership is needed for a facility expansion to be successful. Without a strong “quarterback” to keep the Team on track, the possibility of well-intentioned people running amuck becomes a strong possibility. Clear, consistent communication can usually keep everyone on the same page. It takes effort, but without the “quarterback” calling out clear signals, illegal motion can become a consistent and very frustrating penalty. By Rule, the definition of an Illegal Formation is “At the snap, at least seven offensive players shall be on the line of scrimmage.” There can only be one quarterback and three players in the backfield at the time of the snap. There must be seven players on the line. Linemen don’t always get the recognition for the toughest part of the game, but without them, your chances of gaining any positive yardage is nil. The make-up of your Team needs to include people with a true heart to serve and are willing to do a lot of the hardest work that rarely gets recognized. Building Team’s with too many “players” in the backfield, tend to be agenda driven as opposed to ministry vision driven. Pick your Building Team wisely and eliminate this costly and very frustrating penalty. By Rule, the definition of Illegal Participation is “It is illegal participation to have 12 or more players participating at the snap.” Every church body has well intended players, but are operating outside of the bounds of leadership. Sometimes it is constructive, sometimes it is destructive, all of the time it is confusing and creates frustration for the team. Illegal participation is one of the toughest to manage. On one hand, you want the enthusiasm and involvement of the entire congregation. On the other hand, it needs to be focused and in the right direction. Communication is the key. The involvement of everyone is beneficial. Make sure that a communication chain-of-command is in place to channel this information/participation to the right individuals on the Building Team. By Rule, the definition of Illegal Use of Hands is “An offensive player shall not use his hands, arms or legs to hook, lock, clamp, grasp, encircle or hold in an effort to restrain an opponent.” Illegal Use of the Hands by the church, or its builder, appears most often when it comes to dealing with the governing municipalities. Granted, the list of regulations and rules can be frustrating, but choosing to ignore or go directly against them will result in a significant loss of yardage and/or momentum. The cost of permits and the building requirements to meet local codes can become very expensive. Make sure that you partner with a reputable design/build firm that is familiar with the state and local requirements. Of all the penalties in this article, Illegal Use of Hands has the most devastating impact to the life of the church. This penalty has the potential to literally bankrupt the church and the builder who is not familiar with the “rules”. Every project is unique, involves unique people, objectives and challenges. If your church can stay away from the above, most common penalties, you have dramatically increased the success rate for your upcoming project.